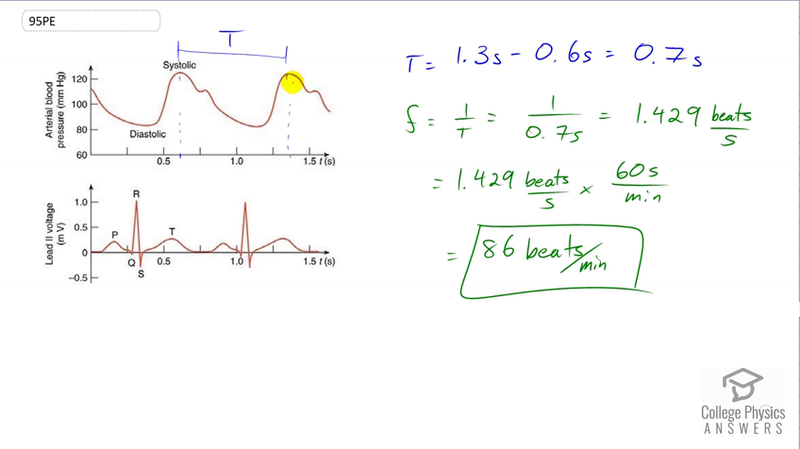 Use the ECG in Figure 20.37 to determine the heart rate in beats per minute assuming a constant time between beats. Figure 20.37 A lead II ECG with corresponding arterial blood pressure. The QRS complex is created by the depolarization and contraction of the ventricles and is followed shortly by the maximum or systolic blood pressure. See text for further description. This is College Physics Answers with Shaun Dychko. From this graph of the electricity going through the heart that’s an ECG, Electrocardiogram, we can figure out the period of the heartbeats. And this is the blood pressure. I guess this is actually the ECG. This part down here. This part up here is just a graph of the blood pressure versus time. We could use either graph to figure out the answer to this question. But I use the period between the maximum pressures that are measured to that the systolic pressure. And this appears to happen at about, this peak happens at about 0.6 seconds. And then the next peak happens at about 1.3 seconds. And so the difference is 0.7 seconds between peaks. And so that is the period. Now the frequency will be the reciprocal of that. So one over 0.7 which is 1.429 beats per seconds. Now we want to have units of beat per minute, so we multiply that by 60 seconds per minute. And we are left with 86 beats per minute.